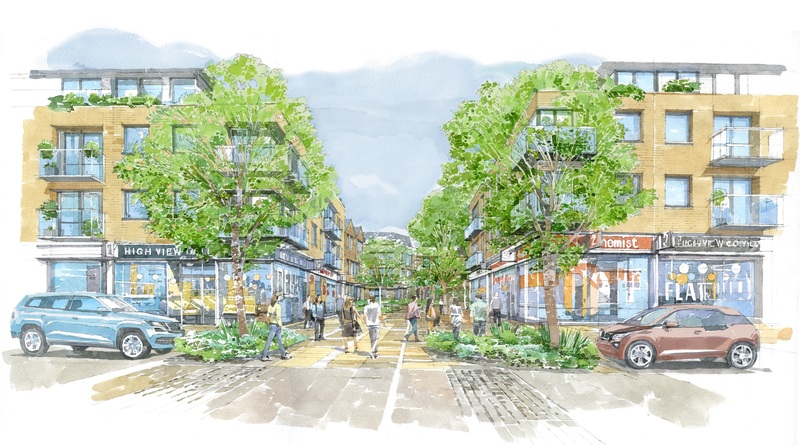 Developer Lovell has recently signed a development agreement with Welwyn Hatfield Borough Council (WHBC) to deliver a £45 million regeneration programme which will transform the heart of South Hatfield. The High View neighbourhood centre, which dates from the 1950s, will be redeveloped with brand-new shops and homes, including affordable homes and properties for sale. Pending planning approval, construction work is expected to start in summer 2019 on the first phase of the scheme. The overall redevelopment of the local shopping centre and the nearby Hollyfield former garage site will provide in the region of 150 new homes for local people. The scheme will deliver a policy compliant affordable homes provision. It will also create high-quality new replacement retail space. In addition, the redevelopment will provide better access to the council-owned Jim McDonald community centre. The programme, which will be carried out in stages to minimise the impact on the centre’s shops and businesses and on the local community, is expected to take five years to complete. Lovell hopes to submit a planning application for the first phase of work towards the end of 2018. Councillor Bernard Sarson, Executive Member for Regeneration at WHBC, said: “A lot is already happening to make Hatfield a more attractive place for shoppers, residents and retailers, and it’s great to see this programme making progress which will help to improve the neighbourhood with brand new shops and housing, including affordable homes. Councillor Duncan Bell, Executive Member for Resources, said: “We are delighted to be working with Lovell, who we believe are the right partner to revive High View with their strong record of delivering large-scale, community-focused regeneration schemes. Alongside the physical regeneration of the area, Lovell will invest in the delivery of job and training opportunities locally, including creating around eight apprenticeships and offering construction courses for residents. The company will also give a £50,000 community grant to the council. Work starts in Hatfield town centre!